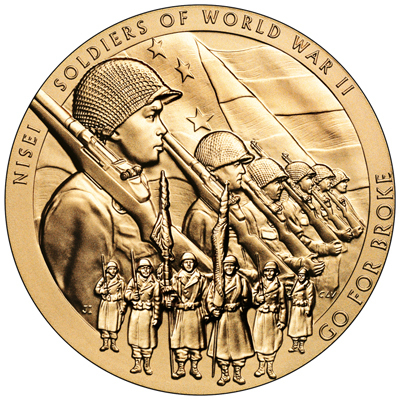 The Los Angeles Regional Congressional Gold Medal Celebration will be held on Saturday, June 9, at the Go For Broke Monument in Little Tokyo from 9-11 a.m.
All veterans of the 100th Infantry Battalion, 442nd Regimental Combat Team and Military Intelligence Service, spouse or widows and KIA next of kin in the greater Los Angeles area who were not able to travel to the Washington, D.C. ceremony or others around the country are especially encouraged to attend. Due to the large number of people expected to attend this event, World War II veterans, spouse or widows and KIA next of kin must register to attend. Each veteran, widow and KIA next of kin along with one guest will receive complimentary admission tickets. Each honoree may purchase up to five general admission tickets for family members at $20 per person. Every veteran, spouse or widow and KIA next of kin in attendance who has not received a Congressional Gold Medal replica at a previous ceremony will receive a CGM replica as a gift, thanks to the generosity of an anonymous donor and fundraising efforts. In addition, every veteran family will receive a copy of Senate Bill S. 1055, which awards the CGM to the 100th, the 442nd and the MIS. The L.A. Regional CGM Celebration is a joint effort of several organizations, including the Go For Broke National Education Center, the 100th/442nd Veterans Association, the MIS Veterans Association of Southern California, the 100th Infantry Battalion Veterans, the Japanese American National Museum, JACL-Pacific Southwest District, the Japanese American Bar Association, and the Japanese American Cultural and Community Center. Registration forms are available at www.goforbroke.org/lacgm.html or by sending an email to [email protected] The deadline to register is Friday, May 25. The committee invites all World War II veterans and their families to help make this a meaningful and memorable event by submitting photos of their veterans for the commemorative program booklet and slideshow. Instructions on how to submit photos are available at www.goforbroke.org/lacgm.html or by sending an email to [email protected] The deadline to submit photos is Friday, May 11. Will there be additional Gold Medal Celebrations besides the June 9 Los Angeles ceremony? Do you know where I can obtain this information/schedule? My 91 y/o father has a graduation ceremony to attend that day and his family is torn between the two ceremonies that he’d like to attend. Besides Los Angeles, the only upcoming ceremony that we know of will be held May 26 in Sacramento. The National Veterans Network (www.nationalveteransnetwork.com), which coordinated the Washington, D.C. ceremony, has been maintaining a list of regional ceremonies. Nothing new is listed right now, but you can check the website later for updates.